Are you interested in running a vending machine business? If you’ve been exploring this option, you’ve probably been attracted by low startup costs, the opportunity to be your own boss, the chance to dictate your own schedule, the idea of growing your own business however you’d like, and the thought of solid profits whether you’re putting in a few hours a week or going full time. There’s a lot to like about going into the vending machine business, which makes the enterprise a promising one for people from all backgrounds and walks of life. So how can you get started and what do you need to know before you take the plunge? In this blog we’ll be explaining how franchises work and how vending machines make money using this structure, taking you from your first investment to your first annual profits. A franchising system is how the vending machine business works in most cases. A franchisor is a company with its own products, its own branding and its own processes, which sells the opportunity to use all of these assets to franchisees – that could be you! This approach allows businesses (like Tubz Vending Franchise and many others, including international names like McDonalds) to grow an ever-bigger brand and expand across counties, countries and even continents with less risk and expense. The system offers benefits to the franchisee too. The individuals who buy into the franchise can walk into a ready made brand and business, taking advantage of its established reputation and materials, from marketing resources to supply chains. Franchisees typically pay a one-off buy-in fee to franchisors, then a range of payment systems can be applied. In some cases, franchisors will take a percentage of annual profits, in others a flat monthly fee is required. How this works will vary widely from franchise to franchise. 1. Franchisees select the business bundle which fits their budget and availability. 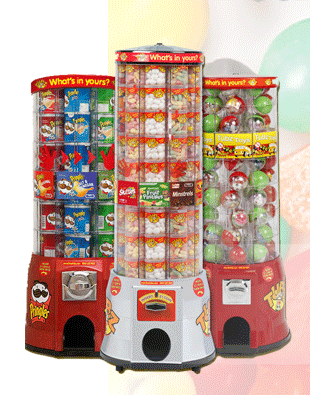 These bundles start at £2,499 + VAT, with sizes ranging from 10 to 100 vending towers. The time investment required starts from just two hours a week and every bundle comes with all of the equipment and resources you need to get up and running. 2. You install your towers at local sites in post codes agreed between you and Tubz Brands. We have a comprehensive database of potential profitable locations and arrange commission either directly with the premises owner or via our corporate Charity partner the ‘Starlight Children’s Foundation’ – and we have already raised £270,000.00 for them. 3. You start operating your franchise and selling treats! From restocking machines and monitoring profitability, to ensuring presentation is good and arranging maintenance, running a vending franchise is pretty straightforward. Should you have any issues, the Tubz team will be on hand to help, whether you need to buy more stock, or are concerned that a location isn’t performing profitably, or you want to expand! 4. Make sure you keep your towers topped up, rather than waiting until they are empty. This will prevent you from losing sales and ensure your machines look as enticing as possible to customers. 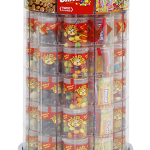 So make sure you visit regularly and keep on top of your vending round. You’ll need to buy a new batch of stock at our low rates, exclusive to franchisees. If you’re selling well, you may even decide to add more machines to your enterprise at this point to boost profits even further. 5. You make money. Now that your vending machine franchise is up and running, it’s time to keep track of your sales. With our smallest 10 tower bundle, just 10 weekly sales will generate £5,200 in turnover annually, leaving franchisees with a very respectable gross annual profit of £2,340 (Profit is the amount of “take home” money you’ll be left with after commission and stock costs are deducted from your turnover). Our larger bundles provide the opportunity for much more substantial profits up to £72,200. 6. Did you know that more than 90% of new business startups fail in the first year of trading, with vending bucking that trend. This is because there are no bad debts and you don’t have to wait months to build up a client bank to call upon – you earn cash from day one! As we mentioned previously, not all vending machine businesses work the same. Some may charge a monthly, quarterly or annual fee. Others may take a more substantial overall commission on profits. To find out more about how each vending machine business works, make sure you research fees closely and talk directly to a potential franchisor before going ahead. Tubz Brands don’t charge a penny more after the initial purchase of your business bundle. Would you like learn more about how our franchise works? The Tubz Vending team works right across the UK and we’re always looking for new franchisees to help us grow even further. To find out more about our system, rates and bundles, explore our website or get in touch today via info@tubzbrands.co.uk or directly on 0845 601 900.